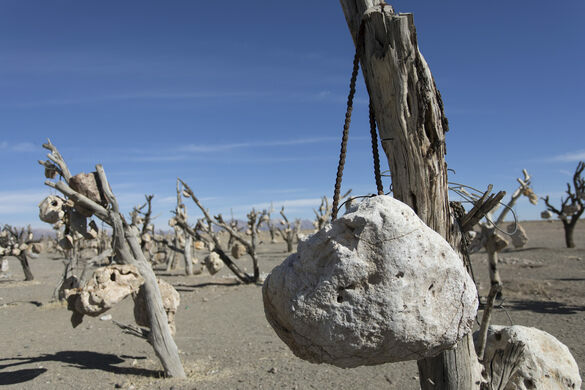 Hundreds of stones dangle from barren trees in the middle of the desert. 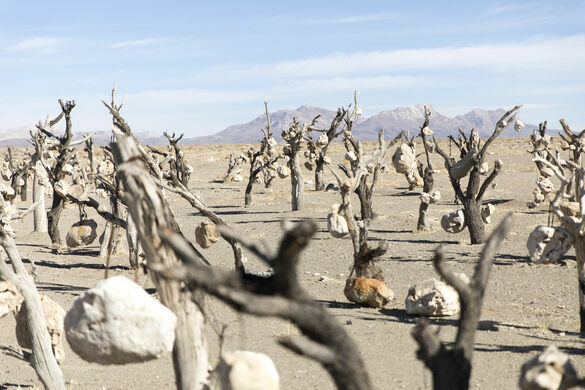 If you’re heading toward the deserts of Kerman, take this 30-mile detour to see the Bagh-e Sangi, or Garden of Stones. Just east of the town of Sirjan lies this remarkable place that looks otherworldly at first sight. Salt cured mummies continue to turn up in this Iranian mine. These little castles each held thousands of pigeons. The worlds largest salt cave is filled with fragile salt sculptures, salt rivers, and huge salt megadomes. 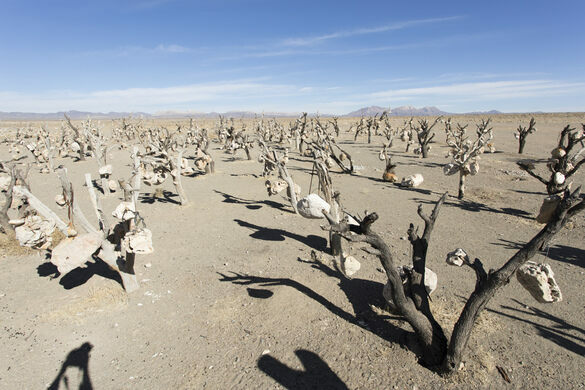 In the middle of nowhere, surrounded by only a few sheep, a new playground, toilet, and sand—lots of sand—lies this garden of stone trees. 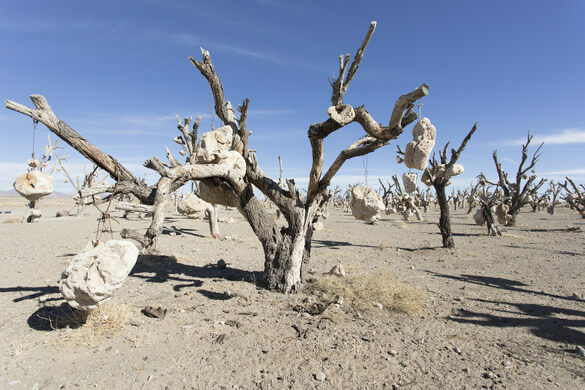 Hundreds of tall dry trees stretch across the sand, each with stones small and large—some weighing over 20 pounds—hanging from the branches. It’s a manmade heaven for weird-seekers. It also looks incredible. There’s also a remarkable story behind the garden. It was created by a hearing-impaired and mute landowner named Darvish Khan Esfandiyarpour. Starting in 1961, he hung each of the stones from thick wires and large ropes on the dying limbs. It was a silent protest against the land reform plans implemented by the Mohammad Reza Shah (Pahlavi) regime that caused the man to lose part of his land, including his real garden. The garden took on a new meaning over the years, with a new tree added for each significant event in the man’s life. Darvish Khan Esfandiyarpour passed away in 2007 at the age of 90, and was buried in his rocky garden. Although he is no longer there to tell the story behind his symbolic stones, the sight is still worth the trip. Only around 6,000 people visit the site each year, so chances are good you’ll be by yourself—accompanied by just the stones and sheep. If you don't find the address, it's pretty simple: From Sirjan take the route 88 towards Baft to the east. After about 45km there's a clear sign post, you won't miss it. This 12,000 year old Iranian cave village has been continuously inhabited for over 3,000 years. The hottest, driest, and most scenic desert on Earth. This ancient fortress in Iran was once the oldest and largest treasury in the world. Incredible miniature towns and buildings created and decorated with thousands of tiny rocks. The sculpture of the deceased cockatoo flops atop its personal plinth. Known as the "Valley of the Moon," this Jordanian wadi is one of the most amazing desertscapes on Earth. Rare pigmented engravings cover the walls of this Stone Age shelter.